One of my favorite things about the holidays are the parties! I love getting dressed up. The fancier the better! Black, white, and red is such a classic color palette and works so perfectly for holiday parties. I picked out two different looks from Nordstrom that would be perfect to wear to a party. I love the girly silhouette of this fit and flare dress, but it was the black and white classic stripe of the dress that had me instantly hooked. A peacoat works well with the dress because it buttons up high and opens up at the bottom as the dress flares out. Adding a red pop in the shoe completes the look and adds to the holiday feel. This skirt is made out of one of my favorite materials- scuba knit. Have you ever felt this stuff? Its super soft and flattering, and holds it shape so well. Perfect for the center pleats and flair of this skirt. It is so versatile too. I can think of so many looks that would work well with this skirt. I originally ordered it in a 2, but it runs a bit big, so I made a quick easy (and free!) exchange with Nordstrom. The top is a thick luxurious fabric, which dresses up the red plaid print nicely. 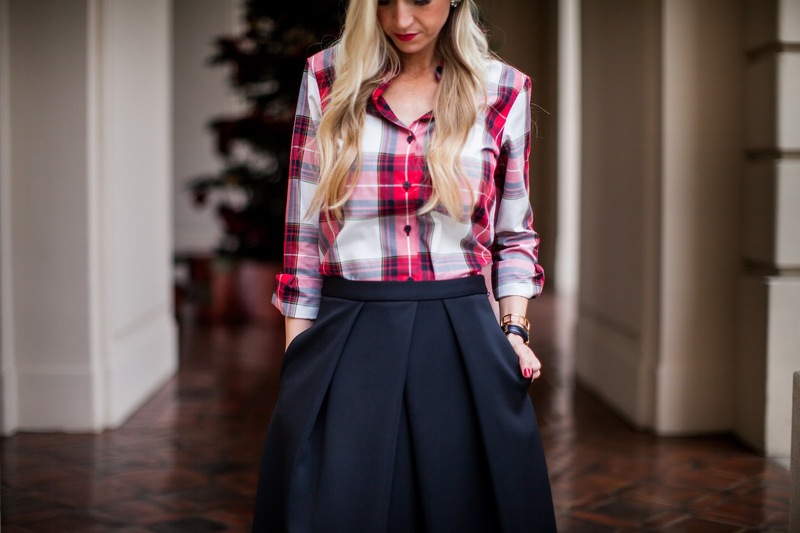 Plaid is a bit unexpected for a formal look, which is why I love it so much! Photos by Kendra Maarse Photography. In collaboration with Nordstrom.